With Core i7 out and Core i5 on the horizon, do you really need to upgrade? Despite the surfeit of Intel X48 and nForce 790 boards on the market, the old P35 chipset has remained the weapon of choice for those dedicated to Core 2 overclocking antics. 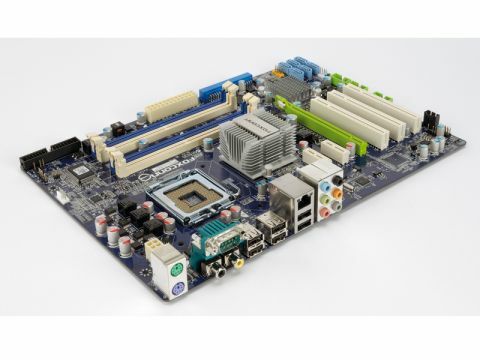 The P45 follow-up in this mid-price Foxconn board is thus a powerful last gasp for DDR2 and Intel chips. It's pretty much neck and neck with the DDR3- powered X48, making it a solid bet if you're looking to build a cheap but punchy DDR2 Core 2 system while you wait for Core i5. The sub-£100 price means it's no frills, but if you want to get CrossFire support then you can pick up the two PCI-e x16 slot P45A for a few bob extra. Do remember that the cramped board layout is far less forgiving for fatboy 3D cards, however.